To choose different discrete integrator formulas, use the IFormula and DFormula inputs. (See Properties for more information about IFormula and DFormula). If DFormula = 'ForwardEuler' (the default value) and N ≠ Inf, then Ts, Td, and N must satisfy Td/N > Ts/2. This requirement ensures a stable derivative filter pole. C = pidstd(sys) converts the dynamic system sys to a standard form pidstd controller object. C = pidstd(Kp) creates a continuous-time proportional (P) controller with Ti = Inf, Td = 0, and N = Inf. C = pidstd(Kp,Ti) creates a proportional and integral (PI) controller with Td = 0 and N = Inf. C = pidstd(Kp,Ti,Td) creates a proportional, integral, and derivative (PID) controller with N = Inf. C = pidstd(...,Name,Value) creates a controller or converts a dynamic system to a pidstd controller object with additional options specified by one or more Name,Value pair arguments. C = pidstd creates a P controller with Kp = 1. A real and positive value. An array of real and positive values. When Td = 0, the controller has no derivative action. When N = Inf, the controller has no filter on the derivative action. 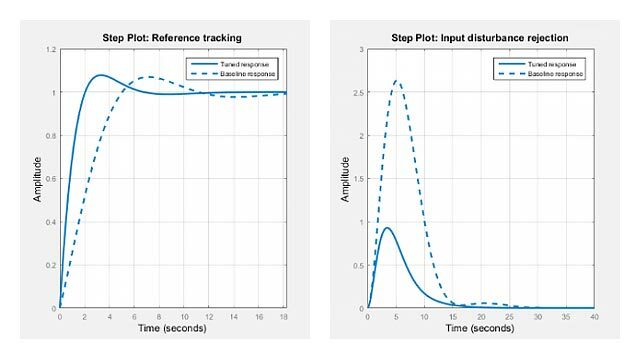 To create a discrete-time pidstd controller, provide a positive real value (Ts > 0).pidstd does not support discrete-time controller with undetermined sample time (Ts = -1). Ts must be a scalar value. In an array of pidstd controllers, each controller must have the same Ts. SISO dynamic system to convert to standard pidstd form. sys must represent a valid controller that can be written in standard form with Ti > 0, Td ≥ 0, and N > 0. Use Name,Value syntax to set the numerical integration formulas IFormula and DFormula of a discrete-time pidstd controller, or to set other object properties such as InputName and OutputName. For information about available properties of pidstd controller objects, see Properties. pidstd object representing a single-input, single-output PID controller in standard form. The controller type (P, PI, PD, PDF, PID, PIDF) depends upon the values of Kp, Ti, Td, and N. For example, when Td = Inf and Kp and Ti are finite and nonzero, C is a PI controller. Enter getType(C) to obtain the controller type. When the inputs Kp,Ti, Td, and N or the input sys are arrays, C is an array of pidstd objects. Proportional gain. Kp must be real and finite. Integral time. Ti must be real, finite, and greater than or equal to zero. Derivative time. Td must be real, finite, and greater than or equal to zero. Derivative filter divisor. N must be real, and greater than or equal to zero. The Trapezoidal value for DFormula is not available for a pidstd controller with no derivative filter (N = Inf). Time delay on the system input. InputDelay is always 0 for a pidstd controller object. Time delay on the system Output. OutputDelay is always 0 for a pidstd controller object. Create a continuous-time standard-form PDF controller with proportional gain 1, derivative time 3, and a filter divisor of 6. The display shows the controller type, formula, and coefficient values. To create a discrete-time controller, set the value of Ts using Name,Value syntax. Alternatively, you can create the same discrete-time controller by supplying Ts as the fifth argument after all four PID parameters Kp, Ti, Td, and N.
Create a PID controller and set dynamic system properties InputName and OutputName. Create a 2-by-3 grid of PI controllers with proportional gain ranging from 1–2 and integral time ranging from 5–9. Create a grid of PI controllers with proportional gain varying row to row and integral time varying column to column. To do so, start with arrays representing the gains. These commands produce a 2-by-3 array of discrete-time pidstd objects. All pidstd objects in an array must have the same sample time, discrete integrator formulas, and dynamic system properties (such as InputName and OutputName). Alternatively, you can use the stack command to build arrays of pidstd objects. parsys is not a pure integrator (I) controller. The gains Kp, Ki, and Kd of parsys all have the same sign. represents a PID controller. Use pidstd to obtain H(s) to in terms of the standard-form PID parameters Kp, Ti, and Td. You can convert a discrete-time dynamic system that represents a PID controller with derivative filter to standard pidstd form. The resulting pidstd object depends upon the discrete integrator formula you specify for IFormula and DFormula. For this particular sys, you cannot write sys in standard PID form using the BackwardEuler formula for the DFormula. Doing so would result in N < 0, which is not permitted. In that case, pidstd returns an error. Similarly, you cannot write sys in standard form using the Trapezoidal formula for both integrators. Doing so would result in negative Ti and Td, which also returns an error. First, discretize the controller using the 'zoh' method of c2d. The resulting discrete-time controller uses ForwardEuler (Ts/(z–1)) for both IFormula and DFormula. Use pidstd either to create a pidstd controller object from known PID gain, integral and derivative times, and filter divisor, or to convert a dynamic system model to a pidstd object. To tune a PID controller for a particular plant, use pidtune or pidTuner. In an array of pidstd controllers, each controller must have the same sample time Ts and discrete integrator formulas IFormula and DFormula. If you require different discrete integrator formulas, you can discretize the controller by directly setting Ts, IFormula, and DFormula to the desired values. (For more information, see Discretize Continuous-Time pidstd Controller.) However, this method does not compute new gain and filter-constant values for the discretized controller. Therefore, this method might yield a poorer match between the continuous-time and discrete-time pidstd controllers than using c2d.